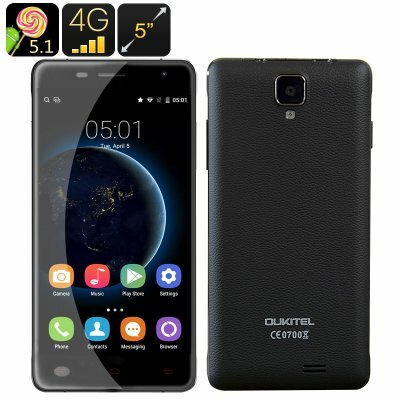 Successfully Added Oukitel K4000 Pro Android Smartphone - 5 Inch HD Screen, 4G, Quad Core CPU, 2GB RAM, Hot Knot, Smart Wake (Black) to your Shopping Cart. This product will be shipped separately from normal products as the stock is currently being sent from a secondary warehouse. Please contact customer support if you have any query. Want a capable smartphone that's tough enough to take a hit or get through a drop that would kill most other phones? You'll definitely want to learn more about what the OUKITEL K4000 Pro Black has to offer – especially with its tough tempered glass screen coupled with its durable machined metal frame. Let's face it: smartphones are very prone to getting banged up. We let them bounce around in our pockets or purses, we leave them on top of various dirty and dusty surfaces, we depend on our palms and fingers to hold them in place, we wave them around our heads whenever we need to talk, and we forget where we put them. Even when we take the utmost care of our phones, some other guy or gal out there could just bump into us and make us drop our precious phones. You could just slip your average phone into an ugly, bulky protective shell – or you could pick the OUKITEL K4000 Pro Black and get a phone that can take the hits and still come out in better shape. Don't believe it? Check out the official OUKITEL video showing the K4000 Pro's screenbeing used to hammer nails into wood! Now that is what we call tough. The OUKITEL K4000 Pro Black does not sacrifice capability for durability. It's got what you want from a mid-range phone, from a 5-inch display capable of putting out a respectable 1280x720 resolution to a quad core CPU and 2 gigs of RAM to create a smoother user experience. It connects to 2G, 3G and 4G mobile networks and also comes with 16 gigs of internal memory, which can be further expanded thanks to support for external memory cards capable of storing up to 32 gigs, thats loads of room for your full media library. Its 4600 mAh battery also powers the phone for up to 40 days on battery standby or about 80 hours of continuous talk time. All this makes the K4000 Pro a capable – and durable – smartphone! The Oukitel K4000 Pro Smartphone comes with a 12 months warranty, brought to you by the leader in electronic devices as well as wholesale Android Phones..